Trey Benton III, the only bull rider in history to win the Tuff Hedeman Fort Worth Challenge after competing their as a youth in the intermission steer riding competition. Fueled by extreme motivation, Trey Benton III has developed into a five-time NFR qualifier by maintaining his level of effort. In the face of fatigue, physical training, pain, and distraction, Trey Benton III of Rock Island, Texas remains motivated to become the best bull riding athlete he can be. Benton is a student of the mind, body, sport, and his four-legged opponents. His pro career began in 2012 when he earned the PRCA Resistol Rookie of the Year title. But the years of highs and lows have taught him to recognize that his own foundation is the key to supporting his solid effort and accomplishments. Persevering past double knee replacement and then a broken femur during the course of his young career, Benton has evolved into a competitor that understands the thrills and spills of the sport. Earning over a million dollars in his nine years as a pro, it is no secret that trusting motivation is the key to his success. Benton is aware it is the only factor an athlete can control. Whether you were on the couch or in a seat at the Thomas and Mack arena last year, you recognized Benton managed his bull riding ability at the 2017 National Finals Rodeo as he mounted an attack on the number one bull rider in an effort to knock Sage Kimzey off the pedestal. Benton finished second and left with $181,981 in NFR earnings. He earned a total of $322,208 for the 2017 season. “I was an underdog the first few trips (2012-14) but last year I finished second in the world, and I'm looking for first this year," said Trey Benton in July. "I grew up watching the NFR in Las Vegas, the noise and the vibes here for those two weeks is unbelievable, I am living the dream and wouldn't have it any other way," said Benton during his NFR run this summer. Benton arrives in Las Vegas as a top ten ranked cowboy earning $100,931.60 on the 2018 pro rodeo trail with hundreds of rodeos in his rear view mirror, this year began with a bang with two 90 point rides to win the San Angelo rodeo for the third consecutive year. He finished fourth in the 2018 Extreme Bull Standings with $37,523.17. He has won 5 rounds in his career NFR competition and has finished in the top ten twice in his four qualifications. A graduate of Sam Houston University, Trey is an all-around cowboy who began his rodeo career as a mutton buster in 1996, he progressed to roping and riding bulls. He holds titles in roping events as well as bull riding including Texas Jr. High School Champion calf roper. Benton can rope both ends in the team roping competition and is a multiple Texas Youth Rodeo champion in bull riding, calf roping, and team roping and earned All-Around Champion buckles in 2008-2010. He racked up titles in the Texas High School Rodeo Association and qualified for the National High School Finals Rodeo twice, once as a tie-down roper and then a bull rider. 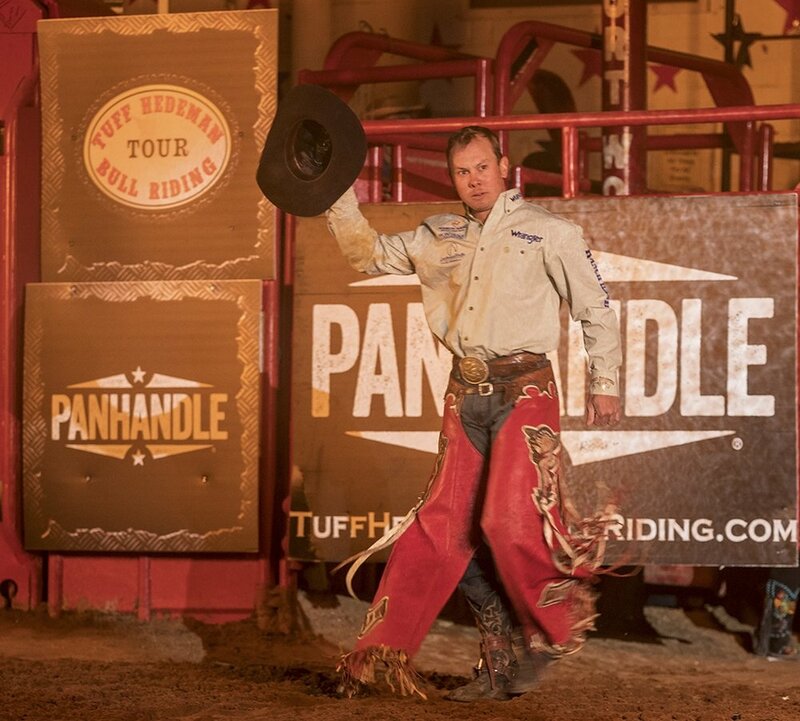 Benton stands alongside the legends as a three-time George Paul Memorial Bull Riding Champion (Del Rio) and won the coveted Tuff Hedeman Fort Worth Challenge buckle in 2014. He remains the only champion of that event that also competed in previous years as a junior steer rider during intermission. He enjoyed a stellar CBR career winning multiple event titles including the premier bull ridings in Fort Worth, Del Rio, Lufkin, and Bossier and competed in numerous CBR World Finals. Twenty-seven-year-old TB3 was born with undeniable gifts. He is a professional athlete with a college degree, and he’s the kind of guy that you don’t mind waiting on for an interview because he is pulling trinkets out of his rigging bag for young fans while signing autographs. In the face of career ending injuries, followed by insanely competitive comebacks, it is not his mind or his physical strength that pervails, but his passion for rodeo and competition. Benton refuses to show any signs of personal doubt. He has always carried on keeping the injuries in perspective. Trey Benton is a cowboy and thrives on the western tradition surrounding that label. Tuff Hedeman welcomes Trey Benton to the Tuff Hedeman Bull Riding Tour.